Disney’s All-Star Movies Resort celebrates classic Disney movie magic and has five different themed areas within the resort. They include 101 Dalmatians, Fantasia and Fantasia 2000, Herbie: The Love Bug, The Mighty Ducks, and Toy Story. Preferred rooms are available at Disney’s All-Star Movies Resort. They are located within the 101 Dalmatians, Fantasia, or Toy Story buildings. They are located close to Cinema Hall, the Bus Stop, and/or the Fantasia Pool. 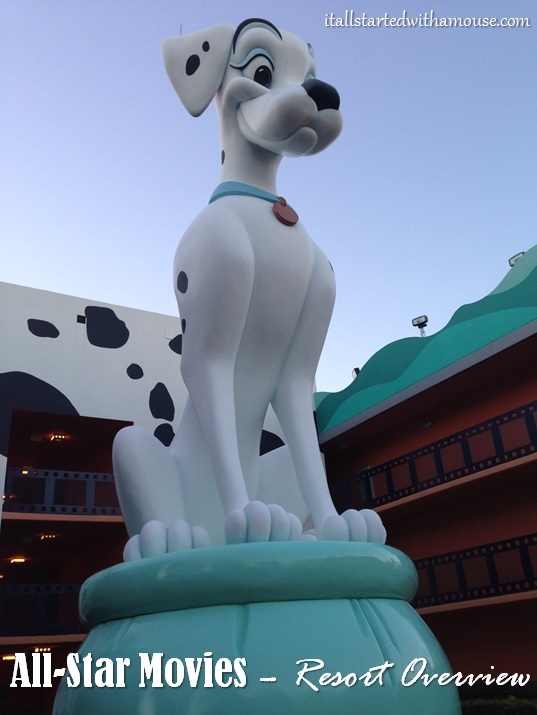 If you are staying at the All-Star Movies Resort (or even if you’re not), be sure to take some time to check out the different themed areas of the resort, you will meet your favorite Toy Story gang, Dalmatians, Herbie, the Love Bug, and more! For the shopper in your family, be sure to check out Donald’s Double Feature, located within Cinema Hall, for great souvenirs. Dining is available inside Cinema Hall at the World Premiere Food Court. Breakfast, lunch, and dinner are served at four different stations, plus the snack shop. Dinner menu items include: Chicken Pot Pie, Lasagna, Salmon, Grilled Chicken Sandwich, Chili-Cheese Hot Dog, Chicken Quesadilla, Veggie Burger, Meatball Sub, Chicken Penne Alfredo, Pasta with Meatballs, Individual Sized Pizzas (Cheese and Pepperoni), and more. They also have an extensive Kids’ Menu, and oodles of dessert options, snacks, salads, and soups. See the full menu here. Standard rooms have either 2 double beds or 1 king bed. Cribs are available upon request. Rooms come equipped with a safe, TV, mini-fridge, iron and ironing board, hairdryer, and free wi-fi. Laundry facilities are located near both pools.